Queen of the Clan: From My Wedding to Yours . . .
From My Wedding to Yours . . . I've been asked to join the yourLDSneighborhood blogger team. I'm now their official wedding blogger. Yep, I get to write all about engagements, bridal showers, weddings, and receptions. I'm also going to talk about some more serious issues such as how to help your non-LDS family understand a temple marriage. I'm very excited to be a part of this incredible online community! 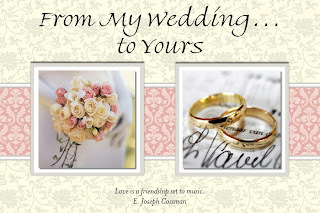 I'll be posting every Monday and Friday on my blog, From My Wedding to Yours. For more info about yourLDSneighborhood, click here. They also have a fabulous newsletter! Well congratulations! I'm sure you'll do great! I on the other hand, have no idea what to say!! Hi KC Mom - Thank you for the congrats! Yeah Danyelle!! Welcome to the team!